How Rare Are Albino Kittens? Only kittens with pink or light blue eyes are albinos. Albino kittens are born with a lack of pigmentation. They have pale pink skin, white fur and pinkish red or light blue eyes. A white kitten with brown, green or golden eyes is not an albino. Albino cats are rare, totaling 2 percent of all felines. Exotic and beautiful, albinos are desired by pet lovers. 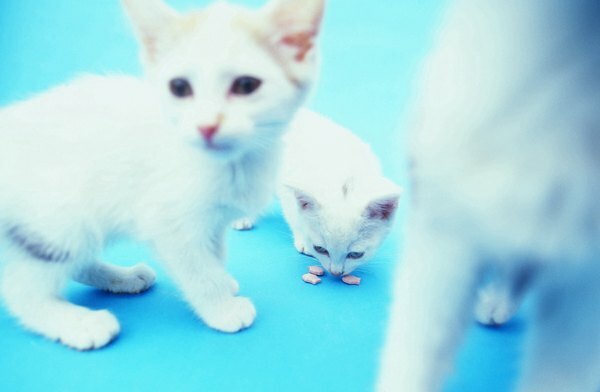 Albino kittens have a likelihood of contracting certain immune system disorders. It is extremely important that your albino kitten receives his vaccinations on time to help prevent health problems. Albino cats and kittens should always be kept indoors. They are sunlight sensitive, making them susceptible to sunburn, skin cancers and damage to their eyes. Albino kittens are sometimes born deaf or blind. They adapt well with an indoor home and loving pet parents. A gene called TYR determines the presence of tyrosinase, an enzyme that must be present for the body to produce melanin. A kitten born with a missing or damaged TYR gene is an albino. His body can't produce melanin, the pigment that determines the color of eyes, fur and skin. The defective gene is recessive, meaning both parents must carry the defective gene to pass it on to their offspring. Melanin plays an important part in protecting animals from the sun's rays. It blocks the harmful rays while letting the beneficial rays through. Melanin is essential in developing some parts of the eyes, such as the irises, muscles, optic nerves and retinas. The lack of melanin causes problems with depth perception, tracking and focusing the eyes. An albino's eyes appear pink because the blood vessels can be seen through the colorless pupils. Albinism appears in many species. Snow Bengals and Oriental breeds, including Siamese cats, are albinos. They are born white, developing color points as they grow. This is because more melanin is produced in the cooler parts of the body, which develop points of color. Siamese cats have light blue eyes, and some have poor vision. Albinism occurs in amphibians, birds, fish, insects, mollusks, reptiles and all mammals, including humans. How Often Do Cats Go Blind or Deaf with Blue Eyes?